MANILA, Philippines – EE BOARD EXAM RESULT. 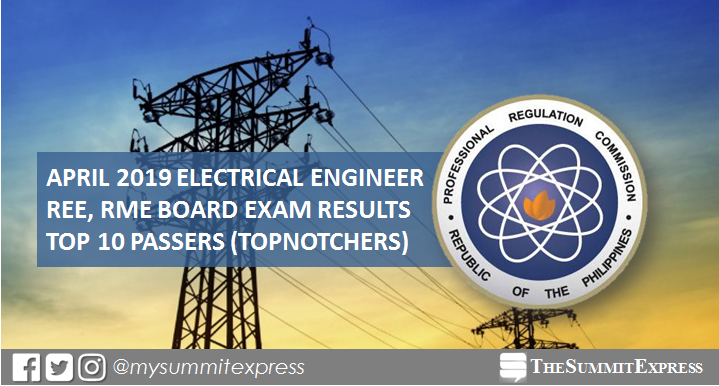 The full list of topnotchers or top 10 passers in the April 2019 Registered Electrical Engineer (REE) and Registered Master Electricians (RME) board exam is available on this page as officially released on Wednesday, April 24, 2019 or in three (3) working days after the exam. The Professional Regulation Commission (PRC) recognizes the highest placers for April 15 and 16 electrical engineer and April 17 master electrician board exam, which were conducted in various testing centers nationwide: Manila, Baguio, Cagayan de Oro, Cebu, Davao, Iloilo, Legaspi, Lucena and Tacloban. Updating for the list of topnotchers...to be posted once released. In the same period last year, Kevin Restubog Relleve of University of the Philippines (UP) - Los Banos aced the REE with 92.75%. Meanwhile, Jayson Butad Bonajos of Bohol Island State University (BISU) - Tagbilaran topped the RME with 93.00%. In the April 2017 exams, Kent Meyler Malones Samaranos of Mindanao State University (MSU) - General Santos City led the passers for REE with 90.90%. Cedie Orain Pamplona of Bicol University (BU) - Legazpi grabbed the top spot for RME with 94.00%. 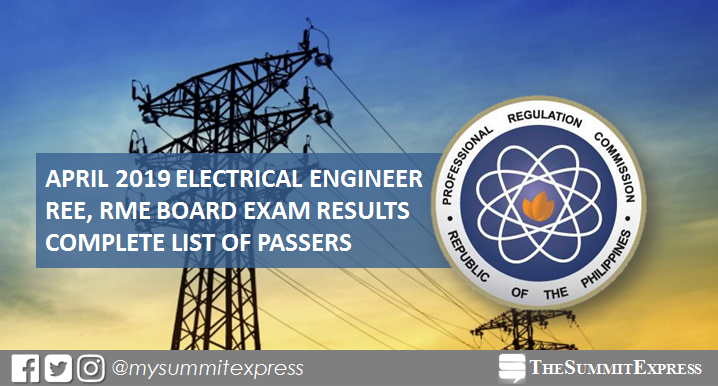 MANILA, Philippines – The April 2019 Registered Electrical Engineer (REE) and Registered Master Electricians (RME) board exam results, which include the list of passers, topnotchers (top 10), top performing schools and performance of schools are released online on Wednesday, April 24, 2019 or in three (3) working days after the exam. The Professional Regulation Commission (PRC) and the Board of Electrical Engineering administered the licensure exam in the cities of Manila, Baguio, Cagayan de Oro, Cebu, Davao, Iloilo, Legaspi, Lucena and Tacloban on April 15 and 16 (REE) and April 17 (RME). Registration for the issuance of Professional Identification Card (ID) and Certificate of Registration will be done on-line. Please go to www.prc.gov.ph and follow instructions for initial registration. As advised, successful examinees should personally register and sign in the Roster of Registered Professionals. Electrical Engineering board exam verification of ratings (passers, non-passers and removal) can be done online. Visit PRC's "Verification of Rating" service and enter the required information to verify your identity. Note that this can be available in few days after the exam. REE board exam covered the following subjects: mathematics, engineering sciences and allied subjects (Day 1) and electrical engineering professional subjects (Day 2). For RME exams, it covered technical subjects ( i.e. basic electricity, test equipment and electrical measurements) and Philippine Electrical Code. According to PRC Resolution No. 1127, the target release of recent Electrical Engineer board exam results is on Wednesday, April 24 or in three (3) working days after the series of exams. However, results may be released ahead of the target or in later date without prior notice. We advise takers to monitor announcement of results starting Tuesday afternoon. In the same period last year, results were released in three (3) working days. A total of 1,315 out of 2,523 Registered Electrical Engineers and 1,831 out of 3,656 Registered Master Electricians successfully passed the Electrical Engineer Licensure Examinations. In the April 2017 exams, results were also out in 3 working days. PRC named 994 out of 2,213 who passed REE and 1,817 out of 3,130 who hurdled the RME. MANILA, Philippines – In a historic first, premiere events producers ProMedia Productions brings a unique musical experience with the first-ever Cinco de Mayhem Music Festival (CDM). A first of its kind, CDM brings together top local artists and DJs in a vibrant and festive celebration of music, youthful spirit, community, and of life at the Vista Mall Daang Hari Open Grounds this coming Cinco de Mayo weekend, Saturday, May 4, 2019. 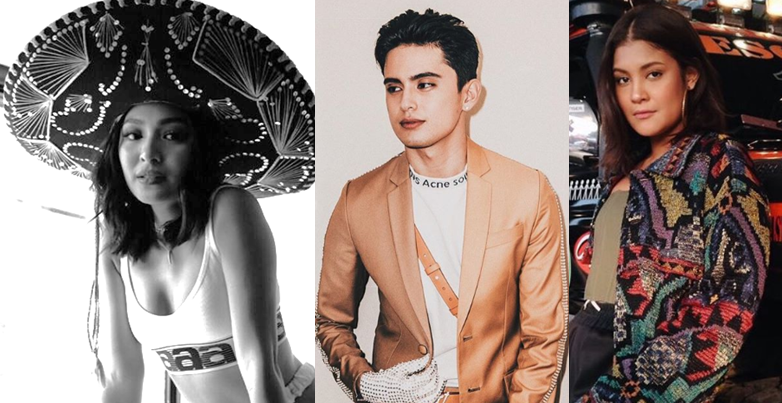 James Reid, Nadine Lustre, Kiana Valenciano bring a unique musical experience with Cinco de Mayhem Music Festival on May 4. The brainchild of actor and host turned musician Alexander Diaz, Cinco de Mayhem is slated to mix the richness of Mexican culture and the unrelenting spirit highlighted in this widely-celebrated annual world event. 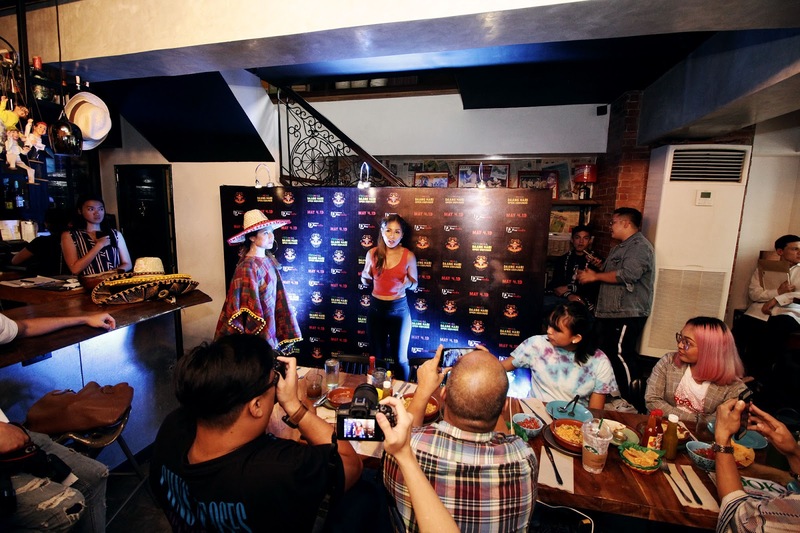 In an intimate gathering with overflowing Mexican fares and drinks at Hacienda Comida Y Cocteles in BGC, media attendees were given a sneak peek onto what’s in store at the biggest summer event to cap all summer events. “I am just so excited that we get to bring game-changers who are making their mark in the music scene—good friends who are now collaborators. I have the utmost respect to the lineup who agreed to make this event momentous in every way,” Diaz adds. Marvel at this unique artistic revelry headlined by local performers James Reid and Nadine Lustre, along with the rest of the Careless Music Manila crew: Astrokidd, Massiah, Kingwaw, and Curtismith, together with rising and legendary musicians and DJs from Quest, Kiana Valenciano, Divine Smith, DJ Euric, Deuce, and Nix Damn P.
Careless Music Manila headlines Cinco de Mayhem Music Festival. Former Pinoy Big Brother (PBB) housemate Divine Smith joins Cinco de Mayhem Music Festival. DJ Euric joins Cinco de Mayhem Music Festival. Deuce at Cinco de Mayhem Music Festival. Nix Damn P joins Cinco de Mayhem Music Festival. To spice the lineup, the country’s first and only female MC Marga Bermudez joins the roster, along with a special surprise performer to be unveiled as we inch closer to the event proper. Apart from the exciting lineup of local acts, expect fun activities set up at the event venue, with artistic installations and festive murals, backdropped by beautiful scenery, merely 30 minutes outside of Metro Manila. Get your tickets now ranging from P3,500 (VVIP), P2,000 (VIP), and P950 (Gen. Ad). For more information and for ticket inquiries, visit Cinco de Mayhem’s official website, www.cincodemayhem.com. Like and follow Cinco de Mayhem’s official social media pages on Facebook and Instagram @cincodemayhemph for real-time updates and upcoming promos. Cinco de Mayhem Music Festival 2019 poster. MANILA, Philippines – The Civil Service Commission(CSC) announces results of March 17, 2019 Civil Service Exam - Paper and Pencil Test (CSE-PPT) also known as Career service examination. 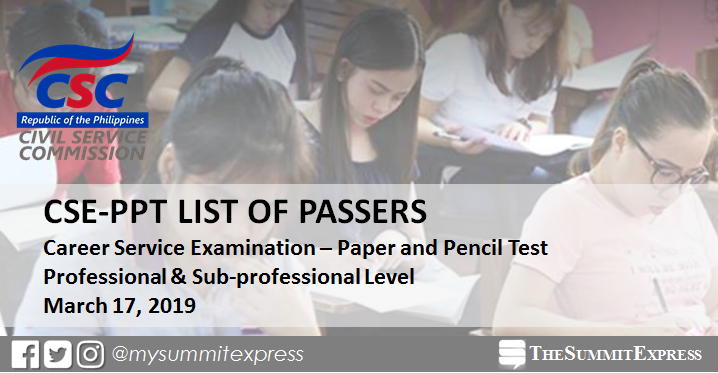 The full list of passers for Metro Manila or NCR sub-professional level exam is available online mid-May or in sixty (60) calendar days after the test. Sub-professional exam passers are eligible for the first level position in the civil service (clerical). Updating for the list of passers...check back for the updates. Examinees, both passed and failed, may generate their individual test result through OCSERGS or the Online Civil Service Examination Results Generation System, which can also be accessed at the CSC website (csc.gov.ph). Concerns on examination result including verification on Examinee Number should be coordinated directly with the CSC Regional Office concerned. Certification of Eligibility for passers (printed on CSC letterhead, free of charge) shall be issued through the CSC Regional/Field Offices. Regular Certification of Eligibility (printed on security paper at cost) is also available. For requirements and procedures, see here. Passers must personally claim their Certification of Eligibility at the CSC Regional/Field Office concerned. Representatives are not allowed to claim on behalf of the passers. Driver's License; Passport; PRC License; SSS I.D. ; GSIS I.D. (UMID); Voter's I.D. ; BIR I.D. (ATM type/TIN card type with picture); PhilHealth I.D. (must contain the holder's name, clear picture, signature and PhilHealth number), Company/Office I.D. ; School I.D. (validated for the current school year/semester/trimester); Police Clearance/Police Clearance Certificate; Postal I.D. ; Barangay I.D. ; or NBI Clearance. Any other ID card not included in the above list shall NOT be accepted. The Sub-professional exam, 165 test items, includes vocabulary, grammar and correct usage, organization of ideas, analysis, clerical ability, spelling and numerical reasoning. The exam also covered General Information items: Philippine Constitution, Code of Conduct and Ethical Standards for Public Officials and Employees (RA 6713), peace and human rights issues and concepts and environmental management and protection. Takers may expect for the release of official CS results between May 6 and 16 or in 50-60 working days. MANILA, Philippines – The Civil Service Commission(CSC) releases results of March 17, 2019 Civil Service Exam - Paper and Pencil Test (CSE-PPT) also known as Career service examination. The complete list of passers for Metro Manila (NCR) professional level exam is available online on or before May 16 or in sixty (60) calendar days after the exam. For several years, the bulk of the examinees come from the central region (NCR). Passers who got at least 80 percent score will be eligible for the first and second level positions in the civil service provided the eligibles meet the qualifications and other requirements (education, experience, and training). Examinees may get their individual test results using the Online Civil Service Examination Result Generation System (OCSERGS), which can also be accessed through the CSC website 15 days after the posting of the List of Passers. Passers should coordinate and verify with the CSC Regional Office concerned the availability of their Certification of Eligibility (CoE) and the requirements in claiming it. A complete directory of the CSC Regional Offices is available at the CSC website. Passers must personally claim their CoE. Representatives are not allowed to claim the same. Claiming of CoE shall be available approximately 30 days after the posting of the List of Passers. Note that any other concerns on examination result including verification of examinee number, examinees are advised to coordinate directly with the CSC Regional Office concerned. The CSC Regional Offices handle the releasing of examination results. The three-hour test for the professional level exam includes vocabulary, grammar and correct usage, paragraph organization, reading comprehension, analogy, logic, and numerical reasoning (English and Filipino). The test also includes general information questions on the Philippine Constitution, the Code of Conduct and Ethical Standards for Public Officials and Employees (R.A. 6713), peace and human rights issues and concepts, and environment management and protection. 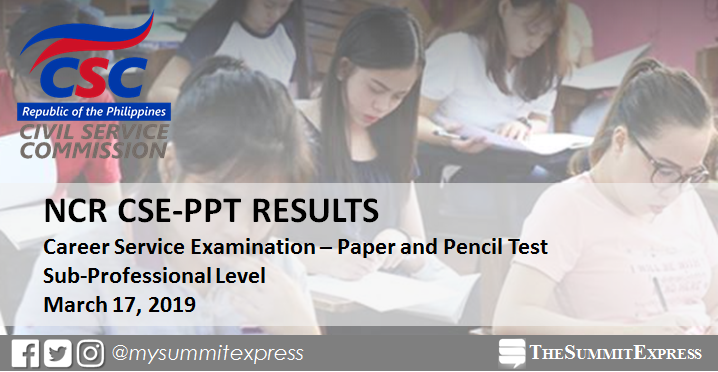 MANILA, Philippines – The March 2019 Civil Service Exam results or Career Service Examination-Pen and Paper Test (CSE-PPT) full list of passers and topnotchers (top 10) for professional and sub-professional level are released online on or before May 16, 2019 or within sixty (60) calendar days after the exam. "Release of List of Passers - within 60 calendar days after the date of exam, or on or before 16 May 2019," the Civil Service Commission (CSC) officially announced on Facebook. The CSE-PPT was conducted in at least 68 testing centers nationwide on Sunday, March 17, 2019. CSC announced that passers who got at least 80 percent score will be eligible for a position in the civil service provided the eligibles meet the qualifications and other requirements - education, experience, and training. The Sub-Professional test has 145 items in English and Filipino. It has the same scope as the Professional test, except analytical ability, but includes questions on clerical ability. The CSC through Examination Annoucement 09 s. 2018, said that exam results will be released within 60 days after the examination through posting the list of passers in the CSC website. "The List of Passers shall be uploaded/posted on the CSC website www.csc.gov.ph within 60 days after the examination," the bulletin stated. Official results can be expected from May 6 (Monday) or on May 16 (Thursday) or in 50-60 working days. 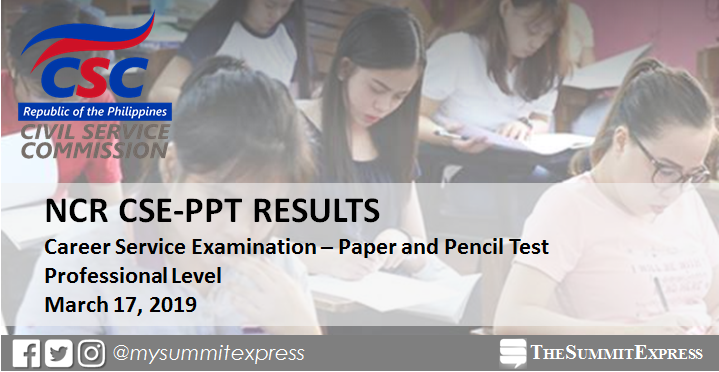 The Summit Express, a website which covers civil service examination for about seven (7) years, will ensure all of its readers and followers on social media to get updates in few weeks or days before the announcement of results. In the same period last year, results were announced in sixty (60) calendar days. A total of 25,602 or 10.71% out of 238,966 examinees passed the Career Service Professional Examination, while 4,573 representing 11.20% of the 40,821 examinees passed the Career Service Sub-Professional examination. CY Rodriguez from NCR topped the Professional level with a rating of 87.01, while Arvin Aliguin from Southern Tagalog topped the SubProfessional level with 88.36 rating. In the March 2017 CSE-PPT, results were released online after forty (40) days. A total of 25,090 (21,640 for the professional level and 3,450 for the sub-professional level) out of 230,736 takers (10.87%) passed the exam. Michael Louie D. Lim from Northern Mindanao, with a rating of 92.45, topped the 188,528 examinees of the Professional exam, while Faye S. Cruz from Metro Manila, with an 89.12 rating, placed first among the 31,169 hopefuls of the SubProfessional level. For the March 2019 CS exam results, takers may also expect of passing rate around 11% or can be translated to around 20,000 passers for both levels of exams. Those who missed the March 2019 exam may file for the next CSE-PPT scheduled on August 4, 2019. Application period will start on May 6 until June 5, 2019. Full details will be available here soon. MANILA, Philippines – The Department of Education (DepEd) announced that basic education level in public schools will continue with its June 3 school opening. DepEd secretary Leonor Briones to retain June 3 school opening for upcoming academic year. Education secretary Leonor Briones confirmed that the school calendar for Academic Year 2019-2020 has already been approved and they have no plans of shifting their school calendar. This came after the Commission on Higher Education's (CHED) recommendation that all state universities and colleges (SUCs) and local universities and colleges (LUCs) should begin their classes in August starting this year. Briones added that such shift is difficult to implement because their population is much bigger compared with the higher education level. She said that adjustments are difficult to make because they have over 23 million learners from Kinder to secondary level in public schools alone. The education secretary gave three reasons why the basic education level refuses to shift their Academic Year opening to August. Briones fears that since their students are relatively younger, they might not be able to endure going to school during the hot summer months. She also mentioned that the facilities available in public schools can only do so much against warm weather. Briones added that the students’ health might be compromised when they are forced to face the hot summer days. “Young kids are more prone to childhood diseases, especially those that are common during hotter months like sore eyes, dengue, measles – among others,” she said. “We might not be able to guarantee the overall health of these learners,” Briones added. The DepEd head also admitted that it's hard to break the tradition of summer break and vacation from parents, students and even teachers. “That’s the time that they are also able to relax and attend to their personal interests,” Briones noted. Just like CHED chairman J. Prospero E. de Vera III, Secretary Briones also doesn't see any problems with differing school calendars in their levels. Briones said that the parents and students might actually appreciate the longer vacation before starting college. MANILA, Philippines – Showcasing the alarming effects of plastics entering the human food chain, students from Adamson University bagged the top prize at the EcoVision Film Competition Screening and Awards Night held at Ayala Malls The 30th in Pasig City. The portrayal of a student striving to have a sustainable lifestyle in “#CantYouSee” secured its spot as best film of the night, while “Wake Up Call” from from Ateneo de Manila University and “Para sa Ikabobote ng Lahat” from Polytechnic University of the Philippines bagged the awards for the 1st Runner-up and 2nd Runner-up films, respectively. The winning entries were chosen based on their adherence to the theme, story and content, cinematic attributes, technical execution and social media engagement. Aside from the best film awards, the EcoVision Film Competition also awarded Best Production Design to “Pagsapit ng Ala Sais ng Umaga ng Hating Gabi” from Far Eastern University, Best Cinematography to “Paso” from Polytechnic University of the Philippines, and Best Sound Editing to “Wake Up Call” from Ateneo de Manila University. Among the members of the selection committee was acclaimed filmmaker Brillante "Dante" Mendoza, who encouraged the students to continue exploring the visual medium as a creative tool to spread awareness and inspire action for environmental protection and preservation. Done in partnership with the Department of Environment and Natural Resources – Environment Management Bureau and its youth program, GREEnducation Philippines, The EcoVision Short Film Competition (PSA Edition) is Epson’s environmental initiative that aims to raise public understanding of the environment and its conservation through informational or PSA videos. “The pioneer batch of the EcoVision Short Film Competition presented inspiring work from student visionaries,” said Donna Ferro, brand and communications head of Epson Philippines. “As a company that is fully committed to environmental sustainability, the EcoVision Short Film Competition serves as our little contribution for a greener Philippines. We are grateful to the students, DENR-EMB and GREENducation Philippines for their passion and support towards this project,” Ferro said. The 10 final entries from the EcoVsion Short Film Competition will also serve as an informational tool for DENR-EMB and its youth arm, GREENducation Philippines, for its ongoing and future environmental awareness projects.